Use TB2H9K2 to reference this item. This coin is on a special mission. The mission is to promote awareness of bikes and riders on the roads. 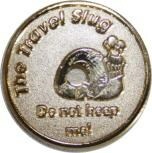 Specifically this coin has been released to promote the fact that 'ROLLING STOPS KILL'. Besides being against the law (you can be ticketed for it), it is a very, very dangerous thing to do. Recently my step-sister and her grandmother were hit while walking across an intersection (in the crosswalk) by a driver who made a rolling stop at a stop sign and never even looked to his right. Luckily they only sustained minor injusries, but it could have been much worse. So next time you arrive at a stop sign or red signal light, please remeber this coin and come to a complete stop and look both ways before proceeding. It is the personal property of Tamster56 who has allowed its temporary use as a Geocaching game piece. It may not be sold, traded, or kept indefinitely. It is NOT intended to become part of someone's collection. Please log it and move it to another cache as quickly as possible so that others may enjoy it!